A vast upgrade to the XENON dark-matter experiment at the Gran Sasso National Laboratory in Italy is set to provide a significant increase in sensitivity by being able to better spot cosmic rays masquerading as dark-matter particles. 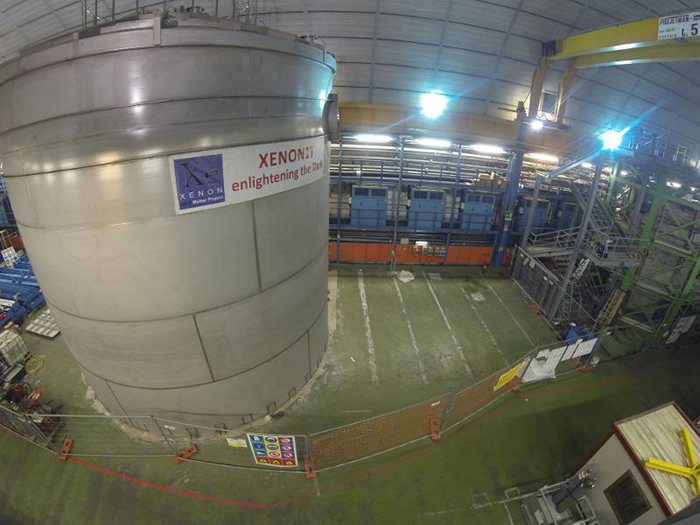 Costing US$11m and expected to start taking data in 2015, XENON1T will contain one tonne of xenon to hunt for weakly interacting massive particles (WIMPs) – a leading dark-matter contender. The XENON detector contains 100 kg of xenon and has provided the world's best limits on the collisional cross-sections between WIMPs and xenon atoms within the detector. But despite the laboratory being situated deep underground to block out most other particles, stray neutrons produced by the decay of cosmic-ray muons can still enter the detector and produce "false positives". Because the signal from the WIMPs, if they exist, will be weak, these false positives could obscure the real signal.